Manchester United coach Phil Neville says the recent win over Arsenal shows the players are beginning to trust the methods of new manager David Moyes. Moyes replaced Sir Alex Ferguson in July before United had their worst start to a league season in 24 years. "Defeat by West Brom was a real wake-up call for the players and manager," Neville told the BBC's Football Focus. "The players are beginning to trust the manager and his philosophy and I think you saw that against Arsenal." Neville, 36, who joined the coaching staff in the summer having played under Moyes at his former club Everton, added: "It was always going to take a bit of time after one man had controlled the club for so long, there was always going to be a transition period." Ferguson retired at the end of last season after winning 38 trophies in a 27-year reign, including last season's Premier League title. And although Moyes's side earned only 11 points in their first eight league games, last Sunday's 1-0 win over the Gunners was their third consecutive victory and extended their unbeaten run in all competitions to nine games since that West Brom defeat on 28 September. However, the victory over Arsenal at Old Trafford came after the visitors enjoyed more possession. Neville also believes striker Wayne Rooney had been outstanding this season, after persistent summer speculation that the 28-year-old could leave Old Trafford. 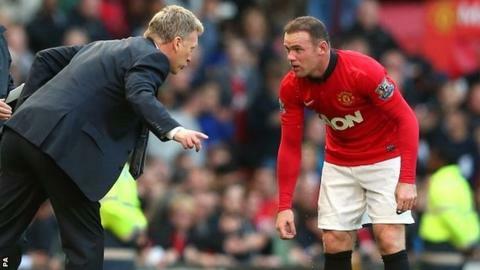 "His level of performance not just in games but in training has been first class," Neville said of Rooney. "And at the start of the season when we weren't in the best of form, he was a shining light. "Now you are seeing everybody else to come into form, and with the partnership between him and Robin van Persie, if they continue at that rate in terms of goals, then we will be right up there. "If you look at facts, when they play together, Manchester United win football games." On United's plans for the January transfer window, the former England defender added: "We have a fantastic squad as it is. In the transfer window early on in the season we were looking for players, that was well documented. "That search continues. We need to keep reinvesting in the squad because if you stand still in this league you get left behind, as Manchester City found out last season when they didn't strengthen as much and they ended up losing the league [title]."